The literature details an eleven hour round trip with an elevation gain of roughly 1700 metres over 28’ish kilometres – the first 6km are the roughly part! The summit of Black Tusk sits at around 2,300 metres and provides some truly spectacular views – sometimes. Those who make their way to the top are divided into two groups; those who spend two days on the way up and those who do the whole thing in one day. From the parking lot at the bottom the first thing you’re going to encounter is 6 kilometres of boring and grueling switchbacks. Okay, well the grueling part may have something to do with the pace you travel at and how many gigantic camera lenses you decide are coming with you to the top. Nevertheless, these switchbacks are mindless to the point that you’ll begin thinking about whether Hans Solo could beat Captain Kirk in a half pipe comp. It’s important to consider what footwear you’re planning on wearing. Hiking boots are good if you intend on spending more than one day and will be hauling around a multi-day pack with tent, stove, and sleeping bag. However, if you’re booting it to the top in one day, something more light weight might be a better option. To be totally honest, I made the mistake of wearing my heavy boots and ended the day with my heels totally raw. Next time, and there will be a next time, it’ll be a nice pair of trail runners instead. 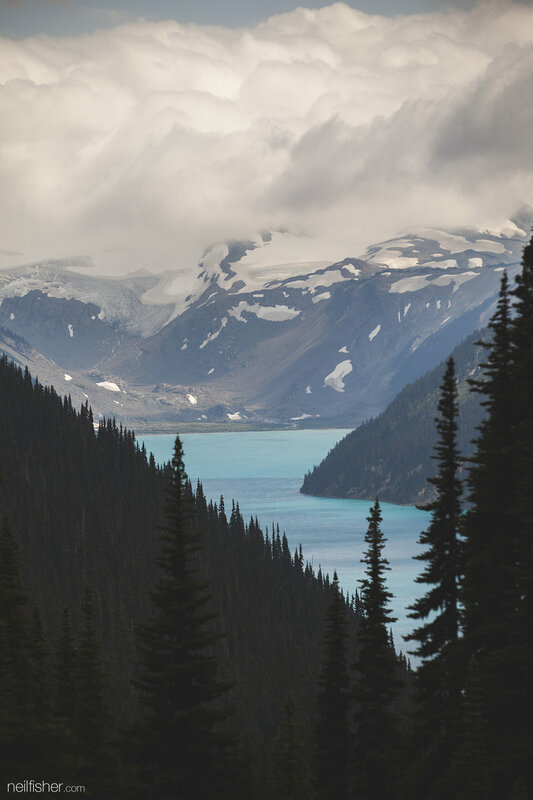 If you’re wanting to reach the summit in one day, you’re likely going to skip stopping by Garibaldi Lake and instead head through Taylor Meadows. The meadows are amazing during early August as the flowers blossom and fill the place with a full spectrum of colour. Oh and the noise is pretty crazy as well, as the countless flowers are visited by millions of chubby looking bumble bees - it sounds like a formula one race. The meadows are relatively flat and in places the trail becomes an elevated board walk, giving you time to look around and forget about your footing. Once through Taylor Meadows you'll encounter the junction; left is you Black Tusk and right is to Panorama Ridge or Garibaldi Lake. From this point on wards it's all up hill and it becomes rather steep. The last kilometre, beyond the 'maintained path', is very loose volcanic scree that makes the going rather slow - on the way down this scree is nice and easy on the knees. Most who venture to the top of Black Tusk end their trek at the base of the chimney as reaching the peak is considered dangerous due to falling rocks and the sheer verticalness of the peak. In the short period of time spent just below the chimney there were very audible falling rocks heard. I can't comment too much on the view from the top as the weather didn't quite cooperate and clouds hugged to summit pretty tightly. It's important to keep in mind the hike to the top of Black Tusk takes on average 11 hours. A lot can happen in 11 hours. Even on the sunniest days, mountain weather is unpredictable and can change for the worse with little warning. A small tumble just below the summit puts you roughly 13km from help. I saw way too many people treating this hike like the Grouse Grind, carrying the tiniest of tiny bags, wearing clothing fit for the beach, and packing barely enough water to sustain life on mars. If you're going to the top of Black Tusk make sure you've got a basic first aid kit, enough water for an 11 hour hike, and something to keep you dry.